Do you have any information about a troop ship or a voyage that is already listed? If so, please let us know! 11-03-07 - Added information on 26 crossings. 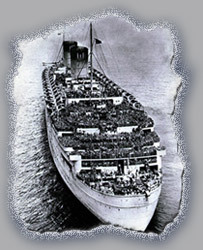 During World War II scores of ships carried thousands of troops to and from the United States, Europe, Great Britain, Africa, Asia and Australia. Web Site Copyright © 2007 Shayne E. Wallesch & Wendy J. Hochnadel. All images are copyright © their respective owners. for those expressly stated to have been photographed by "Shayne E. Wallesch". For questions or comments about this site, please e-mail ww2_troopships@comcast.net. World War II Troop Ships is a "Fang, Ramses & Rupert " production.